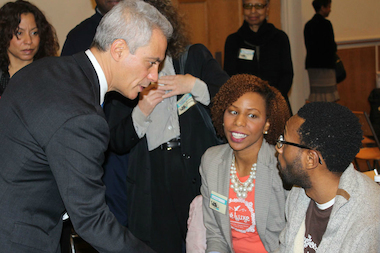 Cortney and Kipron Sigilai, owners of Tre Luxe, a natural hair care product company, chat with Mayor Rahm Emanuel Friday at a Whole Foods workshop for entrepreneurs. ENGLEWOOD — Laine’s Bake Shop got "awesome" news Friday that could help her small business immeasurably: The new Whole Foods Market plans to stock her treats when it opens in Englewood next year. Rachel Bernier-Green, 27, who started her Kenwood business in 2012 with the help of family members, was ecstatic Friday when she was accepted as a supplier for the store at a workshop that put businesses like hers face-to-face with the upscale grocer. “This green light is an awesome opportunity, one that we thought we were several years away from even pursuing,” said Bernier-Green, who does not have a storefront and takes orders online. “The brand recognition that will come along with this will give our business an immeasurable boost." Whole Foods Market partnered with the City of Chicago and the Greater Englewood Community Development Corporation to host three workshops for the city’s small businesses and entrepreneurs at Kennedy-King College, 740 W. 63rd St. Attendees were able to meet one-on-one with Whole Foods Market buyers to discuss how to get their products in the new store, which is being built at 63rd and Halsted streets. Husband and wife business partners Kipron and Cortney Sigilai started their natural hair care product line, Tre Luxe, a year ago and took part in the three workshops in hopes of growing their business. “To be able to expand distribution would be really helpful, not just for us, but for our customer base who finds value in our products, and of course they want it to be as accessible as possible,” Kipron Sigilai said. Whole Foods Vice President Bobby Turner said the store's goal was to find 25 businesses to bring into the store. Mayor Rahm Emanuel said Whole Foods is doing an excellent job of working with all communities. “Our small businesses are the backbone of our neighborhood economy,” he said. “If you were going to call yourself a Chicagoland store, you have to be in all parts of Chicago, in every community, and Whole Foods has answered that,” he said.